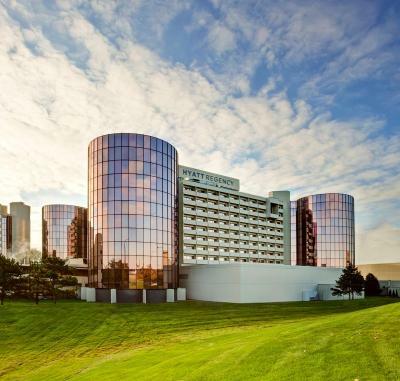 Lock in a great price for Hyatt Regency OHare Chicago – rated 8.3 by recent guests! The breakfast buffet was so delicious! I enjoyed the buffet and the value, My only critique is that the food cooled too quickly by the time I made it down. Stunning lobby, very cool bar/lounge area. The room was comfortable. 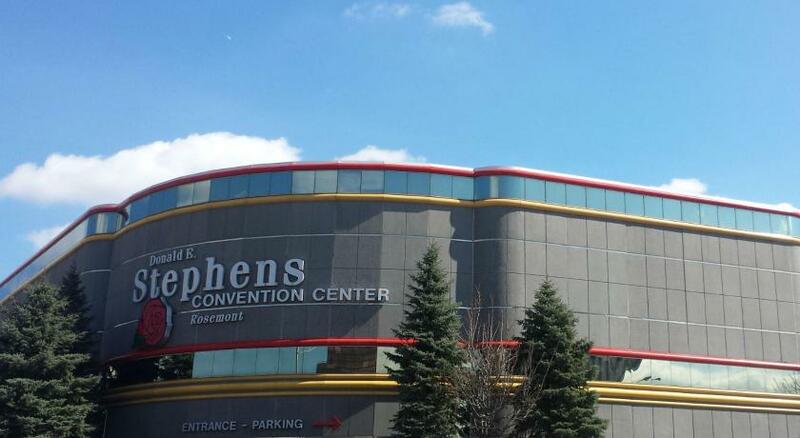 Attached to Stevenson Center for my convention I was attending which was great. It is located near the airport with a shuttle that runs every 20 minutes. Also within walking distance to Rosemont Entertainment District which was enjoyable. Amazing view! Top Floor! We enjoyed beautiful sunset! 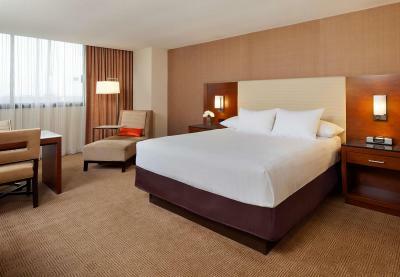 Very nice hotel with great ambience...room was extremely comfortable and well furnished. I liked the room size. Tv size. The bellhop and valet people were great. Actually they were nicer than the front desk people. I grew up in the area and was always fascinated by this hotel. We visited there several times for banquets or special occasions but I never stayed there. Had an early flight leaving O'Hare at 7am, so I decided to stay here and avail myself of the fress shuttle. This is a spectacular place just from an architectural standpoint. 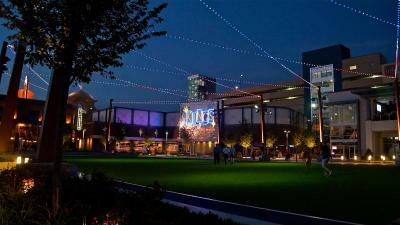 The bars and restaurants here are great, but you are very close to the Rosemont convention area with all of its shops and dining options as well. I only stayed one evening reliving my time as a little kid in awe of the new place on the block. I'm still in awe and enjoyed my stay. It was close to the convention center for our event. 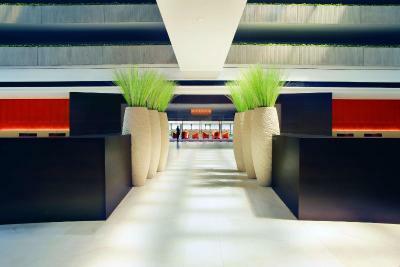 Very big and nice rooms, comfy bed, beautiful lobby and great restaurant downstairs. excellent service at the front desk - they quickly processed reservations for 30+ guests stranded at the airport. 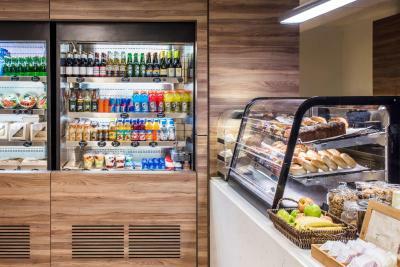 24/7 gym was well equipped and the snack store downstairs was very practical for an early wake-up/flight. There is a shuttle specific to that hotel that passes every 15 minutes during the day and each 30 minutes at night. 5 minutes distance from the airport. Overall, great stay and highly recommended. Clean and easy to reach airport! helpful staff and big TV. 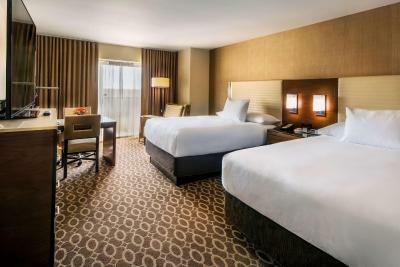 Hyatt Regency OHare Chicago This rating is a reflection of how the property compares to the industry standard when it comes to price, facilities and services available. It's based on a self-evaluation by the property. Use this rating to help choose your stay! 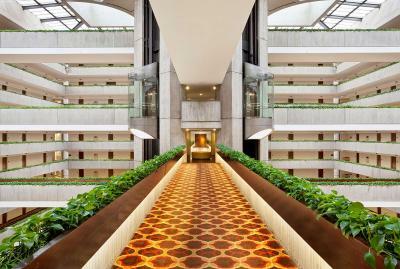 Connected to the Donald E. Stephens Convention Center via indoor walkway bridge, this contemporary hotel is conveniently located minutes from O’Hare International Airport and offers free 24-hour airport shuttle services, on-site restaurants and a state-of-the-art 24-hour business center. 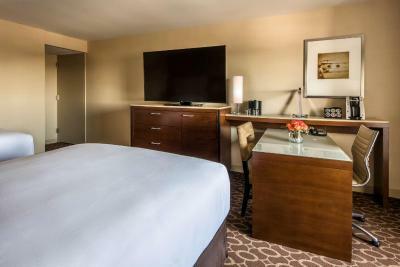 Every room at Hyatt Regency O’Hare provides a 65-inch flat-screen cable TV with on-demand programing and a large work area with a desk chair. An iPod docking station is also included. O’H American Grill offers savory classic American dishes made with locally-sourced ingredients for lunch and dinner, along with an energizing breakfast buffet. 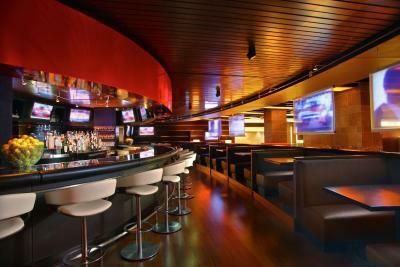 Guests can choose from an array of signature cocktails, local craft beers and quality wines while enjoying small bites at Red Bar & Lounge, which features 25 flat-screen HDTVs. A 24-hour fitness center offering concierge and yoga services is offered at the hotel. 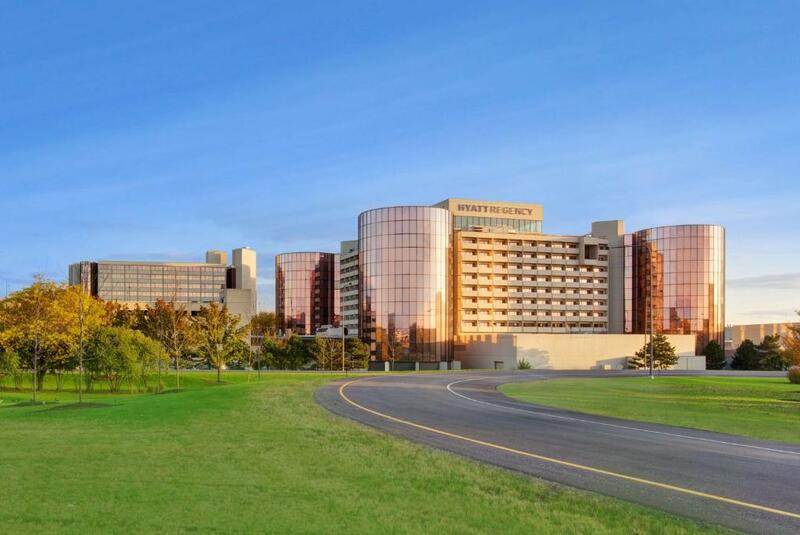 Over 110,000 square feet of flexible meeting space is available on-site, along with a gift shop and dry cleaning services. Fashion Outlets of Chicago is less than a mile away. 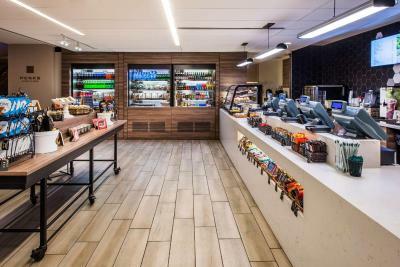 The hotel is a 6-minute walk away from the Rosemont Blue Line Transit Stop, offering easy access to the famed shopping, dining and entertainment in downtown Chicago. 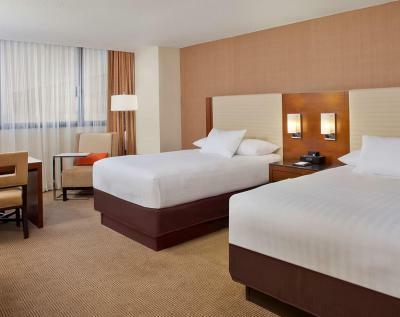 When would you like to stay at Hyatt Regency OHare Chicago? 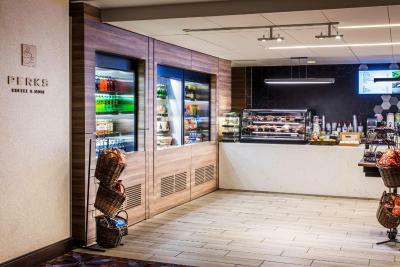 This room offers access to the Club Lounge, which includes complimentary breakfast, evening appetizers and a selection of alcoholic beverages. 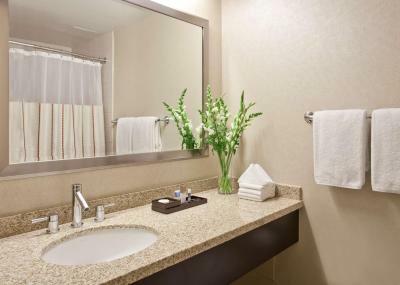 This room includes a private bathroom with a marble vanity, hairdryer and bath robe. Upscale KenetMD bath products are also provided. Located on a high-level floor, this room offers a view of the surrounding area, along with a private bathroom with a marble vanity, hairdryer and bath robe. Upscale KenetMD bath products are also provided. This spacious suite offers a separate living room with a luxury couch, 2 lounge chairs and tables. Smoking is permitted in this room type. This room features a balcony, along with a private bathroom with a marble vanity, hairdryer and bath robe. Upscale KenetMD bath products are also provided. This 2-story suite features a 6-person conference table, a spacious living room and 2 additional 37-inch flat-screen TVs. 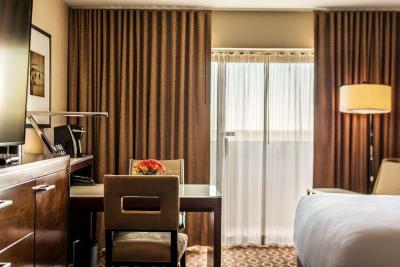 This suite features a iPod dock, air conditioning and cable TV. 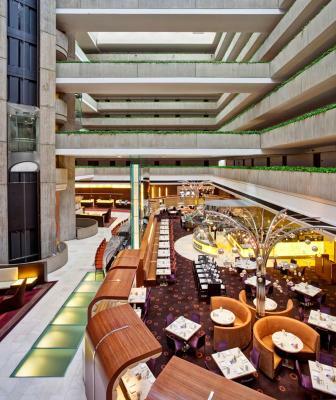 Luxurious contemporary 11-story, 1096 room airport hotel with 4 mirrored glass towers and 10-story atrium lobby with lighted glass elevators. Complete with O'H American Grill, Sushi in Red Bar, Red Bar and Perks. 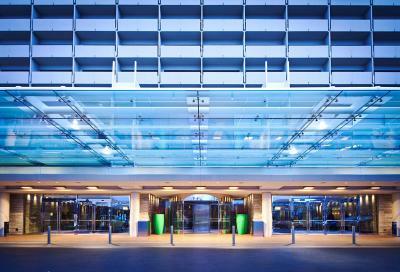 Enclosed skyway connects Hyatt Regency O'Hare to the Donald E. Stephens Expo Center. Full service business center available to all guests. One of the largest ballrooms in the Midwest. 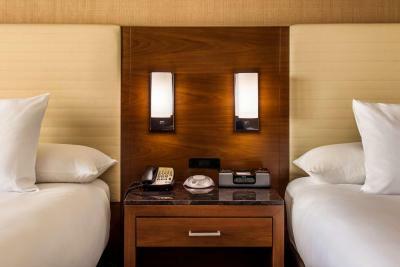 House Rules Hyatt Regency OHare Chicago takes special requests – add in the next step! 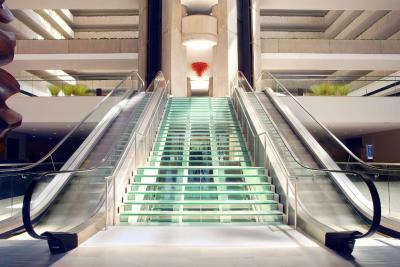 Hyatt Regency OHare Chicago accepts these cards and reserves the right to temporarily hold an amount prior to arrival. The complimentary shuttle runs every 30 minutes from 0:00 to 4:00 and every 20 minutes from 4:00 to 23:59. Paying for extra for parking. Nothing. I loved everything about this hotel! The room had a tiny bathroom with a "public" toilet handle vs. a "normal" toilet handle. The food was great and the location can't be beat. I wish there had been a pool but the facility was so nice otherwise. The staff was not helpful on numerous occasions and just not very friendly especially compared to another hotel we stayed at afterwards. Our room was tiny. The room at the next hotel in Chicago was 4 times the size. They offered zero amenities to regular guests. Water in the room was $4.00. They had a hotel store but the prices were exorbitant. A bottle of water was $6.75. A single can of beer was about the same. So overall you were held hostage to very high prices if you were thirsty or hungry. We asked if there was someplace where we could walk to buy things and there was nothing unless you used Uber etc. Other hotels offered Happy Hours and breakfast. What a difference. A hotel should make their guest feel comfortable, the staff friendly. The price was less so maybe it is a get what you pay for thing. The bed was way too stiff and we didn’t sleep comfortably at all. Confused about my charges when my room was $189 and the valet was $42 and my bill was about $60 more. There was only 1 con and that was could hear every plane coming in loud as day from early morning to late night. Windows could be better for sound proof. I wish the downstairs bar was open later than midnight. It seems as if it closed shop almost the moment things started hopping and interesting characters stopping by. Maybe it was a good thing though, I almost overslept the next day. The breakfast. We love a buffet when staying at hotels, however were informed when we arrived at the restaurant that there was no buffet on offer that day with no explanation. The a la carte menu was limited, but the food we were provided was good. We stayed as we had a layover on the way back home, so as an airport hotel the location was excellent for us. The room was clean and comfortable, the bed was huge and very comfortable with a selection of pillows. It was a freezing night, but the room was warm and inviting. The entertainment selection was excellent as was the option of amenities- there was a list in the room of everyday items you may need (face wipes, sanitary products etc) that you could call housekeeping and they would leave them on your door in a bag free of charge. Airport shuttle was prompt and complimentary. Room was very far away from lobby, bathroom old, no free water. Every pillow was feather, so was the comforter. We are both allergic. It took 45 minutes to get someone to bring us non-feather items so we could sleep. The food was ok, not outstanding but edible. We were on the 6th floor and it was not quiet at all. The shower was the smallest I’ve ever seen. Both of us were very disappointed overall.